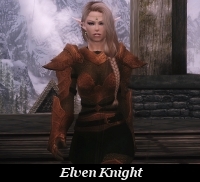 This mod add the Elven Knight heavy armour (female only) to Skyrim. The armour is composed of 15 different pieces plus a wig for the hood that can be created at any normal forge and are found under the Daedric section. All pieces are upgradable at workbenches and fully enchantable. 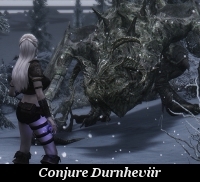 You can reuse any part of this mod into your own mod but all I ask in return is that you give me credit if you distribute any part of this mod. 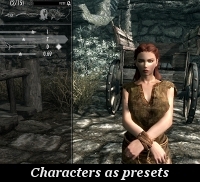 If you want to reuse the female body credit Brokefoot, Kurese and Dimon, too, and send a PM to Brokefoot before uploading your mod. 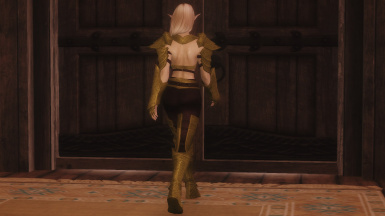 If you want to reuse the pants, skirt or trousers you must credit Dimon too and release your mod on Nexus. If you want to reuse the female wigs you must credit zzjay, PeggyZone and LaughingVampire too. 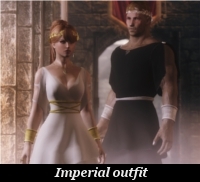 You cannot port the helmet, the pauldrons, the gauntlets, the belt, the tasset and the boots meshes/textures into another game as those objects are part of vanilla Skyrim. Thanks to Bethesda for creating Skyrim. 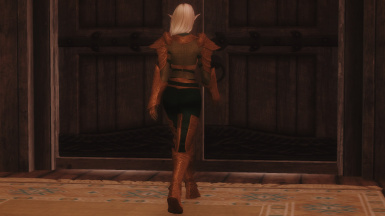 Thanks to Dimon for the UNP female body and for the clothes resources. 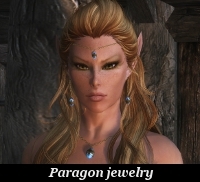 Thanks to zzjay for porting to Skyrim the Demoness hair used for the female wigs and also thanks to PeggyZone for the original hair and LaughingVampire for porting it to Oblivion. Thanks to expired6978 for the source code for custom hair colours. Thanks to Nexus for the a one-stop-shop resource for authors and players. Thanks to all the modding community for all their tutorials, tools, help and support. Especially, thanks to TES Adventures, the Clan Dlan, Bethesda Official Forum and the Nexus communities. 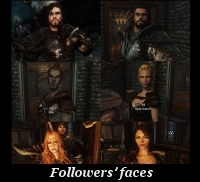 Thanks to all of you that are using this mod and are helping me to improve it with your suggestions. 31-08-2014 - Fixed the wig meshes: now they point to the corerct texture files. Thanks to Mikyluna for the animated gifs. ¡Gracias Miky! 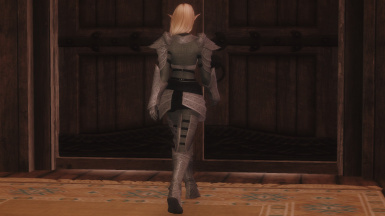 The ratings for the armour are similar to those of the Daedric Dragonscale armour. The armour comes in 4 different colour combinations: Silver metal and black leather, Gold metal and red leather, Copper metal and green leather and Black metal and brown leather. There is a wig for the hood changes colour with your character's hair colour. 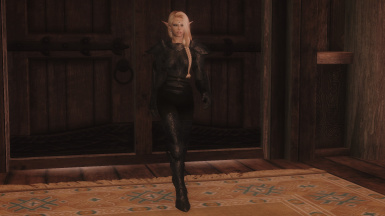 This only works on the player, so it is called "Elven Knight Wig - Player". 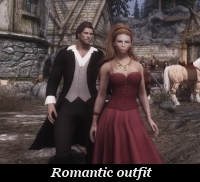 The ability of the wig to keep the colour when unequipping/equipping it or when exiting Skyrim completely and loading a saved game, it is managed through scripts that require SKSE version 1.6.16 or higher. 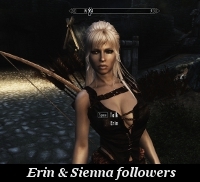 The scripts work for vanilla hair colours and custom hair colours added by the RaceMenu mod. If you don't use SKSE or use an older version, when the wig looses its hair colour use the showracemenu console command to set your character's hair colour again and that will fix the wig's colour. 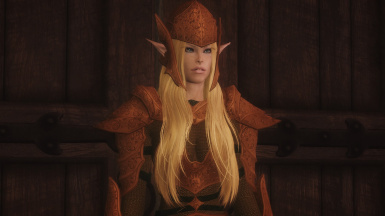 There are also other 8 wigs that have a fixed colour, intended for followers or other NPCs. This makes a total of 69 new items (provided I counted them correctly) added to the game. You can combine the pieces of the different colours. 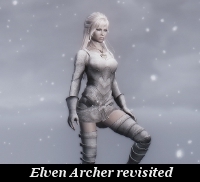 The female bodies used for the armour are the default UNP bodies (http://skyrim.nexusmods.com/downloads/file.php?id=6709). 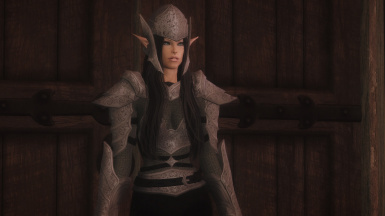 But, if you use the chainmail version of the cuirass you can use any body mod as it covers the body completely. 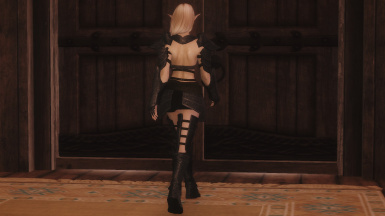 If you use another body mod you may see weird textures in places were the clothing shows the skin or see some clipping. 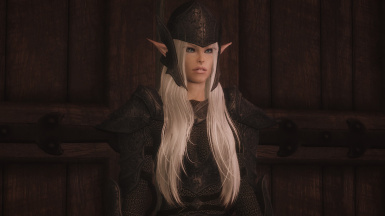 The ability of the wig to keep the colour when unequipping/equipping it or when exiting Skyrim completely and loading a saved game is managed through scripts that require SKSE version 1.6.16 or higher (SKSE). If you don't use SKSE or use an older ersion, when the wig looses its hair colour use the showracemenu console command to set your character's hair colour again and that will fix the wig's colour. 2. Select the file in the Mods tab of NMM, and click on the "Activates the selected mod" button. If asked if you want to overwrite existing files say "Yes to all". 1. Extract the files of this mod to a temporary location (you can use 7zip: http://www.7-zip.org, to unzip them) and chek the folder structure. 3. Open the Skyrim launcher and in "Data files" check the AsharaElvenKnight.esp. Make sure that the esp is loaded after Skyrim.esm and Update.esm and that both are active. 1. Select the file in the Mods tab of NMM, and click on the "Deactivates the selected mod" button. None that I am aware of. If you find anything, please tell me. There is some clipping in some poses. The wig and helmet are visible when equipped by beast races, but they may clip as their head has a different shape than the human head. 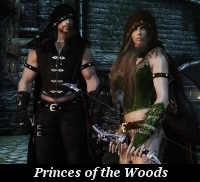 The scripts for the player's wig work for vanilla hair colours and custom colours added by the Race Menu mod by Expired. If you are using custom hair colours added by another mod they may not work (I just don't know). If you find anything else, please tell me. * Foaman's UNP Clothing Merchants. 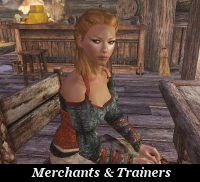 The items of this mod are added to a merchant of that mod. * Nekomata17's Ashara Elven Knight UUNP. Conversion of this mod to UUNP. 1.1, 31-08-2014 - Fixed the wig meshes: now they point to the corerct texture files. 1.0, 28-08-2014 - Initial release. You can contact me leaving a comment at the mod's thread, sending me a PM or leaving a comment at the mod's thread. You can find me on Nexus as SydneyB: http://www.tesnexus.com/modules/members/index.php?id=259193. You can find me on the Bethesda official forums as Ashara: http://www.bethsoft.com/bgsforums/index.php?showuser=364891. 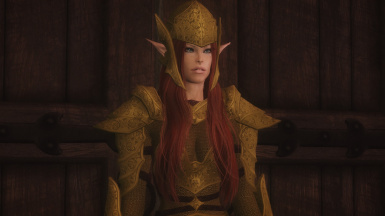 You can find me on Clan Dlan as Ashara: http://www.clandlan.net/foros/index.php?showuser=6932.